Well, once again I was too ambitious last week and didn’t make anywhere near all the food I had planned. We ended up going out to dinner with friends one night at a new-to-us restaurant, The Outlook Cafe, in Rio Rancho. (Review forthcoming!) As well, we had our monthly celiac/gluten free potluck meeting, after which I am always stuffed to the gills from all the yummy food and usually don’t eat much the rest of the day! So, you’ll find that this week’s plan is just another iteration of last week’s plan. So it goes, right? This week’s host for the swap is Angela’s Kitchen and her theme is slow cooking. I have a great vegetarian slow cooker cookbook and thought about making the wonderful vegetarian pho again but had been browsing around over at A Year of Slow Cooking and saw this incredibly delicious sounding soup. And I have a feeling I might need something this comforting this week. Crockpot Broccoli and Three Cheese Soup from Stephanie at A Year of Slow Cooking – sounds decadent and totally comforting! Be sure to head over to Angela’s Kitchen for more meal plans. 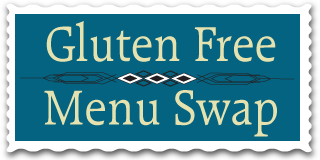 Thanks for participating in the Gluten Free Menu Swap. Your menu is delicious. I love all the links you shared. Now I’m off to check them out! I tried Stephanie’s Pesto Minestrone Soup she posted last week on her A Year of Slow Cooking site. It was pretty amazing soup. I’ll have to check out your choice. I was spying that one too, Wendy, it’s been bookmarked! Although my husband isn’t a huge fan of pesto for some reason…I just won’t call it that and he’ll like it just fine, me thinks! Two cookbooks I’d love to own – the rice cooker one and the slow cooker one. I am all about appliances that make my life easier. And lead to fewer dishes to wash! Why are you anticipating needing comfort food this week? Are there challenges coming up ahead? I hope everything goes well, whatever they are! Ha! I want your cookbooks too! I have them wish-listed on Paperback Swap, but it looks like everyone likes them and isn’t giving them up so easily. Do you know Herbavoracious blog? I won the rice cooker cookbook from his publisher as I was one of his recipe testers recently. Fun! Yes, creamy polenta is total comfort food, huh? Just like those bean fritters I saw over on your page recently. Something about them said comfort food to me too, probably because I rarely eat anything ‘fried’. Yes, this week was going to be rougher than it has turned out so far, thankfully. I was recently diagnosed with thyroid issues and have been having tummy troubles so I was headed in for another intestinal endoscopy/biopsy today. Ugh. But when the thyroid came back super high, apparently that can cause tummy troubles too, we decided to wait on any more investigations there until we get the thyroid worked out. So I didn’t have to be knocked out and grumpy today! But tomorrow and Thursday I get to have radioactive iodine pumped in me to check out the thyroid and see what’s going on. And thus I get to spend more hours at the hospital this week. Yucky. At least I have some good books to keep me company, and yummy food at home awaiting me! Thanks for your thoughts. They are appreciated!